Hip Cultural Tour - Luxury Riad in Marrakech, Morocco. Book Hip Cultural Tour Today with Hip Marrakech - specialists in English Speaking Accommodation in Marrakesh, Morocco. "Our unique Hip Cultural Tour is an excellent opportunity to witness the country’s diverse landscape, colourful culture and vibrant history." Due to its central location and excellent travel connections, Marrakech exists as the perfect base from which to explore Morocco. 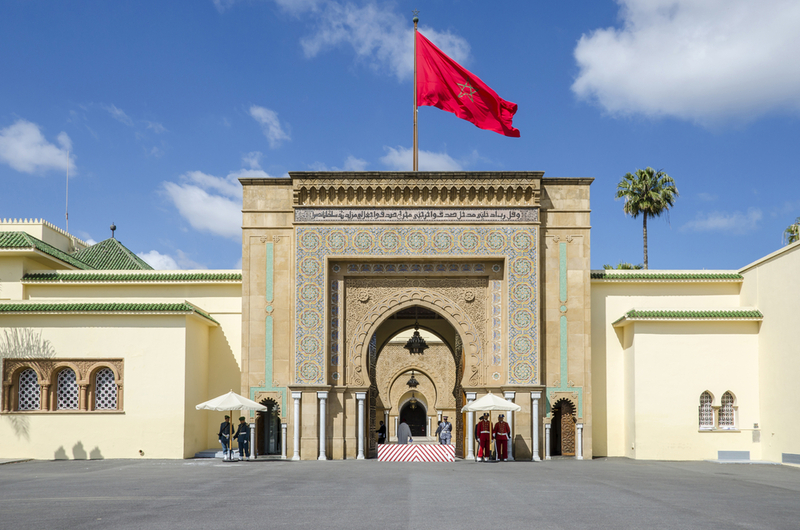 After staying at one of our many traditional riads in the heart of the Marrakech medina, why not take our Hip Highlights Tour to explore the rest of this wonderful country. Our unique Hip Cultural Tour offers adventurous travellers the opportunity to discover Morocco beyond Marrakech. This is an excellent opportunity to witness the country’s diverse landscape, colourful culture and vibrant history, from the majestic Atlas Mountains to the Oasis towns, from the great imperial cities to world famous mosques. This tour has been curated so that it will give you an all-encompassing insight into the country’s identity. Travelling from the frenetic energy of Marrakech, you will explore the Hassan II Mosque of Casablanca; the imperial city of Rabat; the ancient wonder of Meknes; the Roman Ruins of Volubilis; the cultural delights of Fez; the photogenic Chefchaouen; the natural wonder of the Cascades Ouzoud and more. By combining our expert local knowledge and experience organising tours and trips across North Africa, our dedicated team has personally curated a 6-day tour of Morocco. Our Hip Cultural Tour is unique to Hip and will not be found anywhere else! If you are pushed for time or would like to explore more of Morocco, our dedicated team is on hand to tailor and alter any tour or trip to fit your budget, time constraints and desires. Make contact today on + 44 (0) 207 570 0336 or info@hipmarrakech.com and see what we can do for you. Price: from £445 per person. Upgrade to the Hotel and Luxury Spa at Bin El Oudane for only £100 per person. 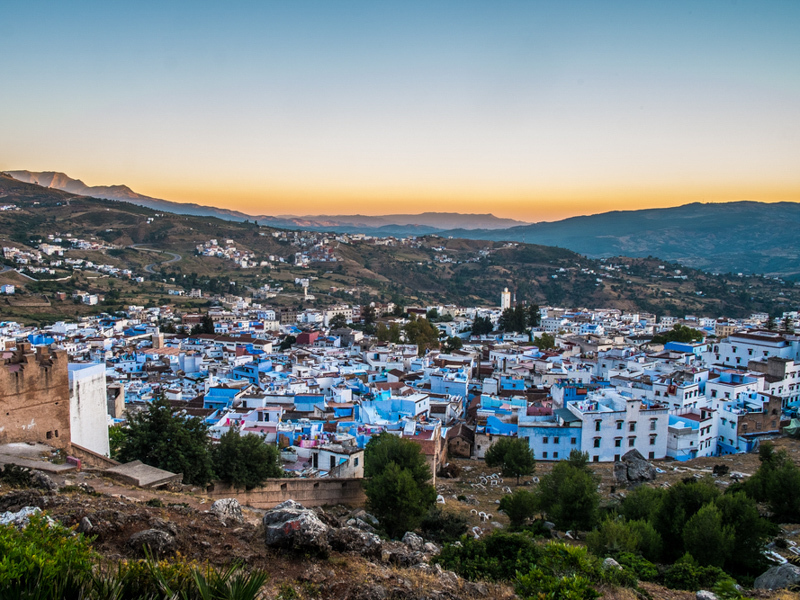 PLEASE NOTE: Here at Hip, we also offer a 7-day version of this Moroccan tour with an extra day to explore Chefchaouen and the surrounding Riff Mountains. Depart from Marrakech, visiting the Hassan II Mosque before continuing on to Rabat for your overnight stay. Bright and early at 9.00am, our driver will meet you at a dedicated pick up point close to your accommodation in the heart of Marrakech. 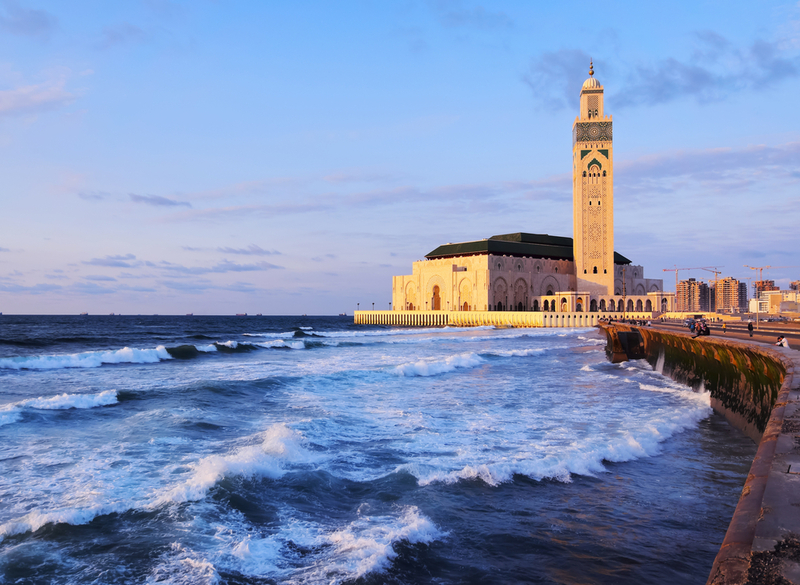 The Hip Cultural Tour begins with a pleasant journey to Casablanca to visit the majestic Hassan II Mosque, the largest mosque in Morocco and North Africa. Unlike the majority of Mosques, which are closed off to people who are not of the Islamic faith, the Hassan II Mosque differs in that it allows visitors of all faiths to come in and view the inside of the building; and how thankful and lucky we are! As designed by French Architect Michel Pinseau for Hassan II, the king of Morocco between 1961-1999, the Hassan II Mosque stands on a prominent piece of land, majestically rising out of the Atlantic sea. Inspired by a verse in the Qu’ran which states god’s throne should be built on water, sections of the mosque’s floor has a glass floor so worshippers can kneel over the water. The hour-long tour of the Hassan II Mosque not only offers the opportunity to see one of the great architectural structures of Modern Islam, but it is also an opportunity to learn more about the religion which is so significant to Moroccan culture and society. From Casablanca, your tour continues on to Rabat, Morocco’s the capital of Morocco since 1956 and your home for the night. Rabat has not yet established itself as a world-renowned tourist destination, but visitors to the city will not be disappointed. Rabat has a long and rich history, and it showcases plenty of monuments from the Phoenician, Roman, Almohad and Merenid times. Set amongst the neat colonial architecture and well-kept palm-lined boulevards you will find many gems, such as the Oujada, a 12th cent. fortress at the mouth of the Bou Regrey river; the Hassan tower and Mausoleum of Mohammed V, both set in serene gardens; and the Chellah, Roman ruins set on the outskirts of Rabat which is now home to many interesting stalk nests. 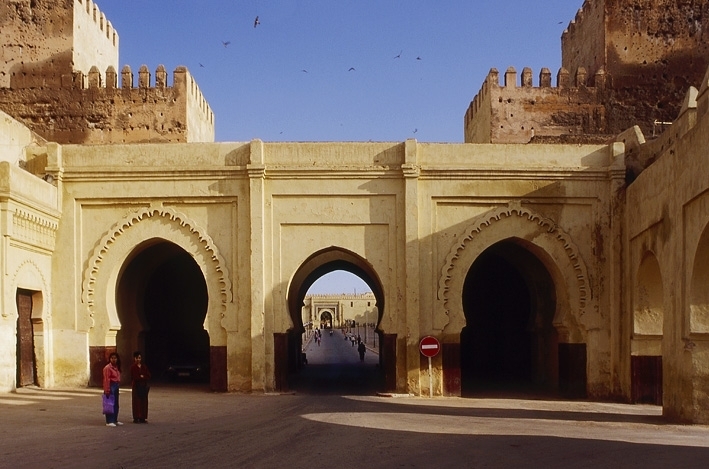 Depart from Rabat, visiting Meknes, Moulay Idriss, Volubliss, before continuing on to Fez for your overnight stay. The second day of the tour begins with a trip to Meknes, which was once the capital city of Morocco during the rule of Moulay Ismail in the 17th and 18th cent. Today, it is possible to trace the architectural legacy of Sultan Moulay Ismail through out Meknes. This includes, Place el Hedim, a popular meeting place with fancy street lamps, food stalls and fountains; Bab Mansour, a grand gateway dominating the southern end of the Place el Hedim square; and Koubba el Khayaine, an ismail which is still used to receive foreign ambassadors. Found a short distance from Meknes lie Moulay Idriss and Volubilis, your next stops on the tour, two locations are key to understanding Morocco’s long, varied history. 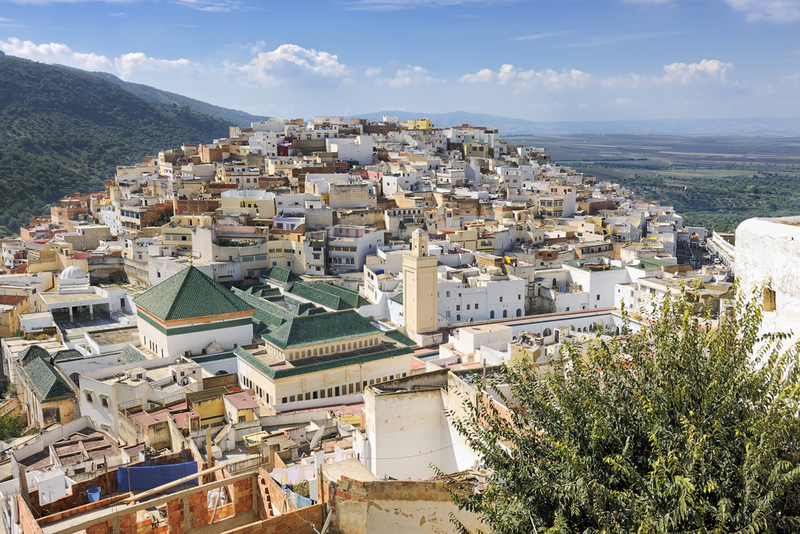 Moulay Idriss holds a special place in the heart of Moroccans. It is here where Moulay Idriss I, the great grandson of the Prophet Mohammed, arrived in 789AD, bringing with him the religion of Islam and starting a new dynasty. Thanks to the religious significance of this town, the narrow streets of Moulay Idriss were once a no-go zone or non-Muslims until 2005. Today, however, this historic town has been opened up for all to explore. Located a short 5km ride from Moulay Idriss is Volubilis, a partially excavated Roman city and UNESCO World Heritage Site. Founded in the 3rd cent. BC, Volubilis became an important outpost of the Roman Empire. Interestingly, however, the city’s distance from Rome meant that it never paid taxes, giving the city a reputation for opulence and extravagance. Today, thanks to its relative isolation in relation to Morocco’s main towns and cities, Volubilis has not been occupied in over 1000 years. Thanks to this, some of the opulence and extravagance has remained intact and can be still seen today: for example, the city is home to arguably some of the best-kept Roman mosaics in the world. From Volubilis, you will continue on to Fez. After settling down in your accommodation for the night, you will have the opportunity to explore the city and all it has to offer. Fez is the intellectual and spiritual home of Morocco and houses pleasant souks, architecturally rich streets and a sprawling imperial district. Exploring Fez with an extra overnight stay. As there is so much to see and do, Fez definitely deserves an extra day of exploration. We strongly encourage you loose yourself in the medieval labyrinth of small, winding streets in the traditional Medina, Fez el Bali. For a more structured approach to exploring the city, we also recommend the Chouara Tanneries, for a chance to see the traditional artisanal trade first hand; Medersa Bou Inania, an ancient theological school from the 14th cent. ; and Borj Nord and Merejid Tombs, which both lie on the surrounding hills offering 360 views of the city. Explore Ouezzane and Chefchauen, overnight stay in Fez. After spending the night in Fez, you will drive northeast in the direction of the Riff Mountains. Situated on the edge of the Riff range is Ouezzane, your first stop of the day. The city of Ouezzane is considered holy by many: it is both the home of the pillars of Sufism, described as the ‘inner mystical dimension of Islam’, and the home of the tomb of several marabouts, saints prevalent within Morocco’s Jewish community. Interestingly, although Morocco’s main religion is Islam, it is thought to have the largest community in the Muslim world. The town of Ouezzane is an excellent introduction to this diverse history. As you continue to ascend further up the Riff Mountains, you will notice how fertile and green the landscape is in comparison to the dusty, red Atlas range. This brings a welcome stillness to your surroundings, allowing for respite from the Moroccan sun. Hidden amongst the lush greens of the Rif range is the dazzling blue of Chefchauen. This blue-rinsed mountain village regularly makes it into the ‘things to see before you die’ and ‘top places to visit in the world’ lists, and it is easy to see why. To simply say, almost every building, every wall, and a lot of the floors are painted in a bright and brilliant ultramarine blue does not do Chefchauen justice. The town is very much a “you must see it to believe it” location, just look at the photos we have included to the right for a taste of what to expect. Aside from loosing yourself among the photogenic buildings , we highly recommend you visit both the Plaza Uta el-Hammam with its unmistakable Kasbah and a leafy square designed by artist Joan Miró in the new city of Ave Hassan II. Travel from Fez to either Benni Mellal or Bin El Oudane for your overnight stay. From day five you will begin your journey back to Marrakech, but that is not to say that these last two days will pass uneventfully. Your route from Fez to the Atlas Mountains, your entrance to Marrakech, is an ancient trade route once used to transport gold, salt and slaves across North Africa. Traces of this industrious and prosperous past are easy to find in many small towns along the route, each with a vibrant and unique history. Your standard overnight stay will be at Benni Mellal. However, to make your trip extra special, why not upgrade to the hotel and luxury spa Bin El Oudane for only £100 per person? This Hotel and Luxury Spa offers a access to a Jacuzzi, hamman, sauna and fitness room; a variety of treatments, according to your requirements including thai, balinais relaxation, foot massages; and a range of water-sports, including water-skiing, wake-board and fishing. If you would like to upgrade from For more information on the hotel with luxury spa at Bin El Oudane or any other aspect of our trip, don’t hesitate to contact us today on + 44 (0) 207 570 0336 or info@hipmarrakech.com. Travel from Benni Mellal or Bin El Oudane back to Marrakech, via Cascades Ouzoud. On your final day, it is time to head back the Marrakech via the majestic Atlas Mountains. The Berbers call the Atlas range idraren draren – “The Mountains of Mountains” – and it is easy to see why. The omnipotent Atlas Mountains stand tall as an unmoving monument, dominating the skyline, stretching as far as the eye can see. The Ouzoud waterfall is also the home of the famous Barbary apes, the naturally tail-less monkeys that you find performing in the main Jemaa el-Fna square in Marrakech. It is delightful to see them roaming free in their native habitat. There are also several lunchtime restaurants (not included) all of which have spectacular views. From 160 euros per person. From 140 euros per person. From 200 euros per person.